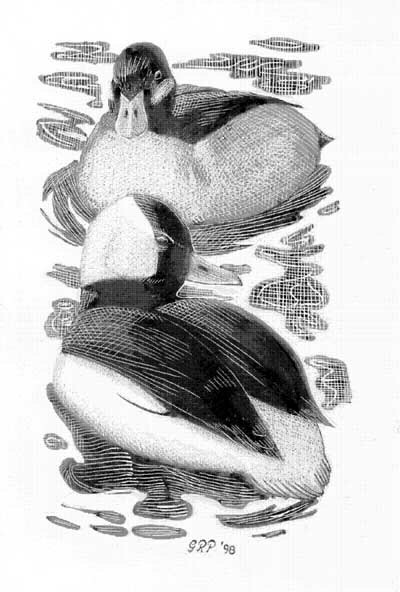 Buffleheads are so appealing they are, in a word, cute. They have been known to inspire cooing from even the most serious-minded, unsentimental birders, and I've known a few. My wife Karyn is not that kind, though she is a scientist, and buffleheads are her favorite birds. This drawing was her Christmas present one year. Buffleheads are quite small and beautiful, especially the males, which are boldly patterned and show a lot of white on their plumage. They look like bright white dots on the waters of the Chesapeake Bay and its tributaries in winter months. They are divers, seeking food under water. When resurfacing, they seem to pop up from the water like, well, a rubber duck. I had promised a drawing of buffleheads as a Christmas present, but I was having trouble coming up with a satisfactory composition, so I finally decided to copy the work of another artist. 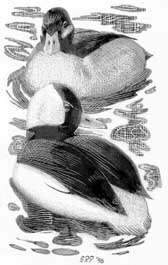 This drawing is based on a wood engraving of tufted ducks, a European species, by the late British artist Charles Tunnicliffe. I modified the birds to look like buffleheads, but otherwise the drawing is as close to a copy of the original as I could manage. A wood engraving or wood block print is made by pressing paper onto the inked surface of a wooden plank that has been engraved with an image. Think of a rubber stamp, and you'll get the general idea. Tunnicliffe the artist was known for his illustrations of birds and farm scenes. He was prolific in many media: etching, wood engraving, watercolor and scratchboard. Karyn and I visited a museum called Oriel Yns Mon near the artist's home in Anglesey, Wales, last June. This impressive little museum included a display of the artist's work: prints, book covers and sketch books. Our visit was too brief, for we were over-scheduled that day. Fortunately there was a friendly curator who took the time to talk. He seemed pleased to meet Americans who had come a long way and gone to some trouble to pay our respects: I think he was impressed. The curator told us about a major exhibit planned for 2001. Unfortunately we won't be there, except in spirit.